I ran so far in this rally. Farther than the car went, probably. In my driver suit and driving shoes. We pulled out of service and transited up to the first stage. As we sat on the hill to get up to the start, we heard "a sound" from the transmissiony area and couldn't shift any more. We tried to fix it a bit, but the clutch actuator basically blew up. So, I ran back to service and told the guys to come help out (we'll take the penalty, alright). I think it was Nick that rode his fancy mountain bike with a moped motor on it up to start while I ran back. We couldn't get it fixed at the start line, so we rolled back down the hill and got pushed back to service. We got things back together enough, but still had no clutch. 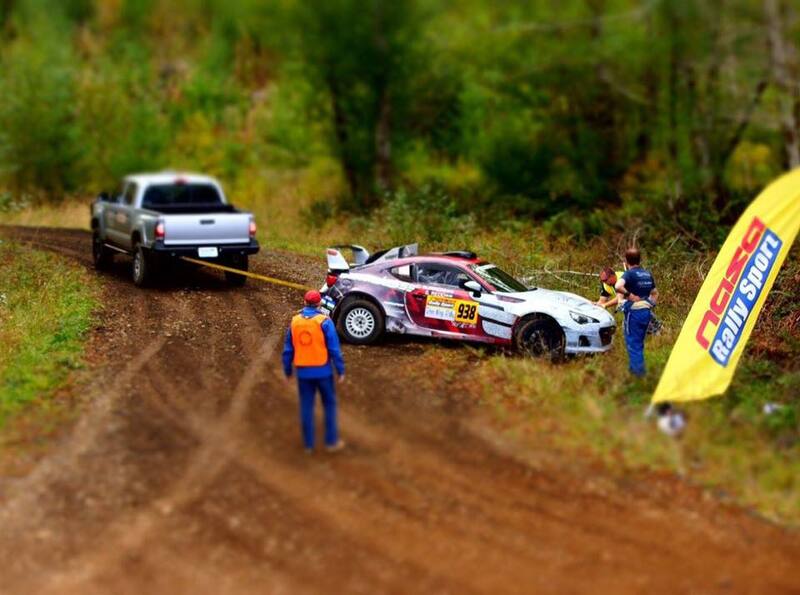 The team boss gave us the okay to drive clutchless through the next loop of stages. It took some convincing of us to get us to try it because it sounded terrible to shift without the clutch, but it did work... so we went for it. In the meantime, I had walked down to the scoring trailer to turn in our time card and walked back to service. Then, when we went for the second loop, I ran back down to the trailer and got the second loop card and ran back. We got to the spectator spot before we got stuck after a half-spin and I had to run down the road with the OK sign. Fun. We eventually got two stages in but they were just okay times after all our struggles. Maybe next year, Doo Wop! Photo by a co-worker's husband.